Salesforce futurist John Hagel was once asked, "What do you not know yet?" His answer was: "Blockchain. It feels important, but I'm not sure we figured out why yet." When new technologies arise, it's easy to jump on the innovation bandwagon, but it is also important to not be naive and give innovation time. Using the case of blockchain, I explain why this is. Technology research firm Gartner has developed a visual representation of how new technologies develop over time: the Gartner Hype Cycle. Technology Trigger: a new potential breakthrough technology generates significant press and interest. In this phase, there might be proof-of-concept stories but there are few usable products and commercial viability is unsure. Peak of Inflated Expectations: a frenzy of publicity generates significant enthusiasm and unrealistic expectations. Some organizations act and some of them may be successful, but many more fail or don’t even act. 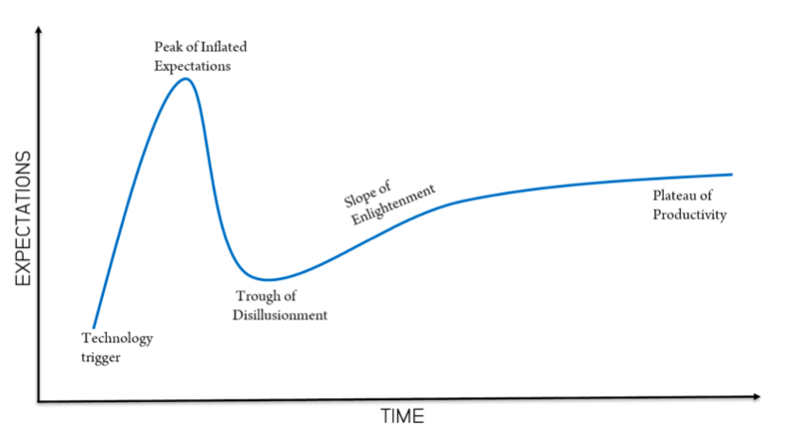 Trough of Disillusionment: the technology fails to meet expectations, quickly becomes unfashionable and press interest wanes. Technology providers fail or fold and the market stays limited to early adopters. Slope of Enlightenment: more use cases of the technology become clear and understood. Next generations of the technology come to the market and more organizations start funding pilots while conservative organizations stay cautious. Plateau of Productivity: adoption starts to become mainstream. Criteria for assessing providers become clear as do the use cases and business case for using the technology. 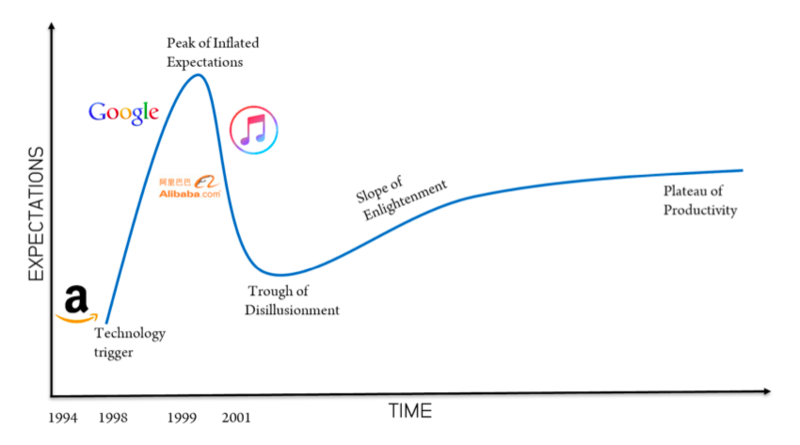 If you follow this model, you might conclude that any technology that is becoming mainstream should have gone through the Trough of Disillusionment. In other words, if blockchain has not seen a phase where it was out of fashion and where press interest waned, its expectation must be inflated. Blockchain is the new internet, or is it? Blockchain enthusiasts might tell you that this technology is the new internet, that we’re at the dawn of a revolution as big as the internet and it’s time to get on board now. They might tell you that it will revolutionize trust, be more secure, and allows for simplified transactions through smart contracts. The slow pace of breakthrough innovation can be seen in the technical development of the internet, which started in the late 1960s with research at DARPA. This led to the invention of the internet communications protocol TCP/IP by Robert E. Kahn and Vinton Cerf, but it wasn’t until 1989 that Tim Berners-Lee invented the World Wide Web. Now let’s look at the recent history and commercial viability of the internet through the lens of the Gartner Hype Cycle. Netscape, founded in 1994, was the first commercial internet browser. The browser was dominant but lost to Internet Explorer and other competitors, its market share falling from more than 90 percent in the mid-1990s to less than 1 percent in 2006. Webvan, an online grocery business founded in 1996, raised $375 million in an initial public offering (IPO) in November 1999 that valued the company at more than $4.8 billion. Two years later, the company lost over $800 million and shut down. World Online, a European Internet Service Provider (ISP) raised €2.9 billion through an IPO in March 2000. In September of that same year, the company was sold to Tiscali for less than 20% of that value, losing investors some €2.3 billion. It’s helpful to realize that many of today’s successful internet companies started only after this initial hype and resulting disillusionment; Facebook and YouTube were only founded in 2004, Airbnb in 2008, and Uber in 2009. 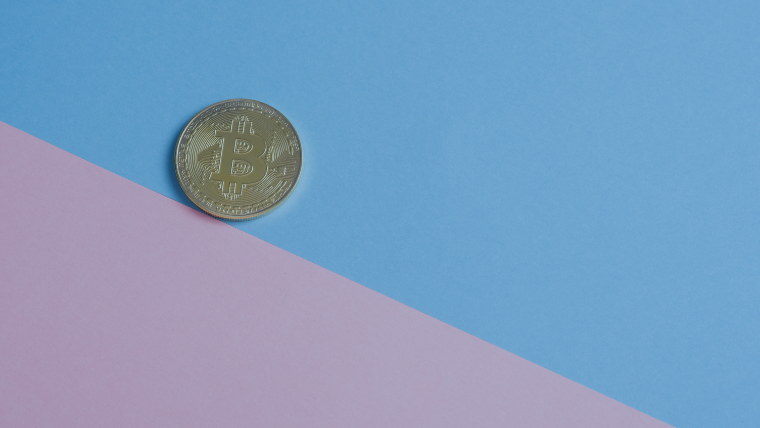 When thinking about a Blockchain-based innovation, consider that in early phases there are big companies that seem to be doing well but that doesn’t mean they will survive. Consider also that coming later to the party doesn’t mean you can’t be very successful. In Diamonds Are Forever, James Bond (played by Sean Connery) boards the Princess Margaret SR-N4 hovercraft to Amsterdam. Sir Christopher Cockerell patented an early design of a hovercraft in the 1870s and the first passenger-carrying hovercraft went from Moreton on the Wirral to Rhyl in Wales in 1962. Today, the hovercraft has been dealt the same fate as the Concorde. There are many examples like this where new technologies seem promising but end up going nowhere. The Sony MiniDisc, while superior to CD and tape, was taken over by the cheaper CD-R. And don’t forget about Betamax, Google Glass, and internet fridges. Many of these never really took off — except for Second Life. It launched to the public in the summer of 2003. Roughly three years later, it reached a million users. The media covered it extensively, universities built campuses in it, countries built embassies and brands built outposts. In 2015, the online virtual world had an estimated GDP of $500 million, more than some small countries. Today, however, it would not be considered a successful technology. 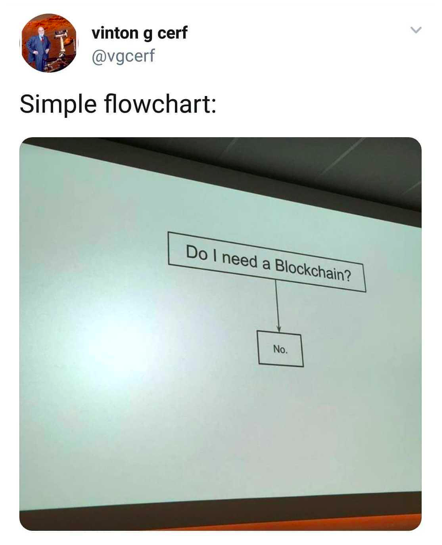 So, what about blockchain? It might be as small as the internet in the early days and it might be growing, but that doesn’t mean it has to become successful. This means that most executives making innovation decisions have to be careful of being overly cautious with emerging technologies. In his book The Innovator’s Dilemma, Clayton Christensen has a similar warning to large incumbent organizations. While the incumbent has the luxury of a huge customer base, new entrants find niches away from the incumbent customer to build their new product. These new entry companies do not require the large revenues of the incumbent and thus have more time to focus and innovate before they scale, seemingly out of nowhere. 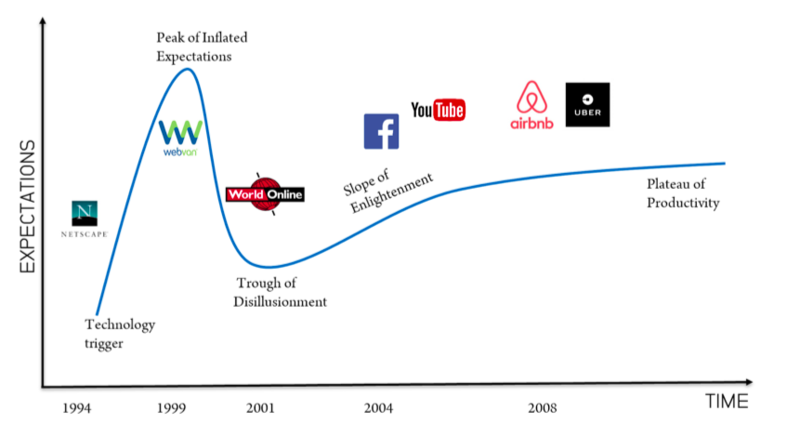 Again, looking at the same Gartner Hype Cycle, we see that some of today’s most successful internet companies were around at the start of the hype. In 1994, Jeff Bezos incorporated Amazon. In May 1997, Amazon went public, raising $54 million with a valuation of $438 million. Google was founded in 1998 by Stanford Ph.D. students Larry Page and Sergey Brin. The IPO in August 2004 gave Google a market capitalization of more than $23 billion. Alibaba, the China-based marketplace was founded in 1999 by Jack Ma. At closing time on the date of its IPO in September 2014, Alibaba’s market value was $231 billion. iTunes was announced in January 2001. In February 2010, it was the largest music vendor globally and the iTunes Store’s revenues in the first quarter of 2011 were nearly $1.4 billion. This mean that even if you are early in adopting Blockchain, it’s not impossible to make it big. It will probably take time, it will probably require youthful tenacity and the power of your entire organization, but there might be a way. When innovating, we often want to leverage new technologies; they foreshadow excitement, growth, and opportunity. When new technologies arise, we don’t want to be the ones to miss the boat. Blockchain is one such technology today. It’s up to us to not be skeptical; progress, after all, comes from new developments that might not be neatly packaged. And we shouldn’t be naive because not all new development is progress.